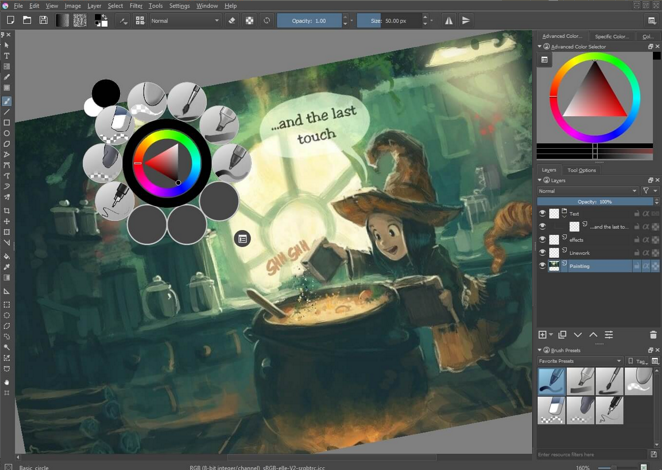 We now have a backported-from-upstream-Debian build of the popular KDE creative paint program, Krita 3.3.1, in our test repository. Version 3.3.2.1 is in the works. Krita is intended for the artist that creates from scratch, rather than processing existing digital images. I did mention I leveled up by learning how to use pbuilder to cross-build packages. Now updated to 3.3.2.1 in the test repo! I also have generic Debian Stretch builds in the openSUSE build service and at least one user reports that it works great. The latest and greatest 4.0.1 release is now in the test repo! With a complete rewrite of the vector layer file format, the addition of Python scripting, a new text tool and much more, Krita 4.0 is one of the biggest releases ever. There is so much to explore and enjoy! As a team, we’re happy and proud to have reached this milestone and we’re looking forward to build on Krita 4 for many releases to come! To always keep a backup of your Krita 3 files before working on them in Krita4! In some cases, to convert your vector and text layers to raster layers before working on your old files in Krita 4! Note that on all platforms it is possible to keep Krita 3 and Krita 4 running side by side. On Windows, use the zip archive downloads, on Linux the appimages and on OSX the disk images, dragged to some other place than Applications. Krita 4 and Krita 3 share settings and resources. And we now have updated to the latest 4.0.3 bugfix release in testing. Krita 4.0.4 is now in the test repository. As usual, it's built against standard Debian Stretch packages except for the backported vc-dev build-depend, which means it requires nothing from the test repo for runtime libraries...it's vanilla Stretch-compatible. The big fix in this update is that it loads the Python library correctly, making the Python scripting usable. Whoops... forgot a post for the 4.1.0 update. One nice addition is that it adds support for the new heif image format (default for the new iPhones). Anyway, we now have the 4.1.1 bugfix update in our test repo. After a initial build failure, I managed to track it down to a bit of new code that tested for the version of Windows it might be building against, but required at least Qt 5.9 instead of our 5.7. Luckily, since that code wasn't going to run in a Linux build, patching out the new include line allowed it to build with 5.7.